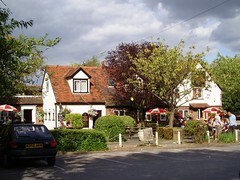 McMullen pub in Theydon Bois. Entering this pub is a little like walking into someone's house; coming in through the main entrance, you pass a sideboard filled with candles, and the interior is made up of a number of little rooms all connected. They also have several picnic benches, shaded by umbrellas, out the front. Kake, Ewan, and other Tube Walkers visited on a Saturday afternoon in August 2008. Real ales available were McMullen Cask Ale, McMullen Country Bitter and McMullen AK. Food appears to be served all day; when we arrived around 4:30pm the menus were still out. Food seems to be on the "interesting" side of normal pub food, and like many McMullen pubs a number of the main courses are available in smaller portions at lower prices. They also have a decent range of herbal and fruit teas (none of which we tried). A sign seen in August 2008 said that children must vacate the premises by 9pm, so one assumes that they are welcome prior to that time. Accessibility: there's a shallow step at the front entrance, and then a shallow ramp up to the bar and main seating area. A step down to a smaller area, and another step up from there to the toilets. Last visited by Kake, Ewan, and other Tube Walkers, 23 August 2008. Last edited 2013-05-10 07:50:45 (version 6; diff). List all versions. Page last edited 2013-05-10 07:50:45 (version 6).